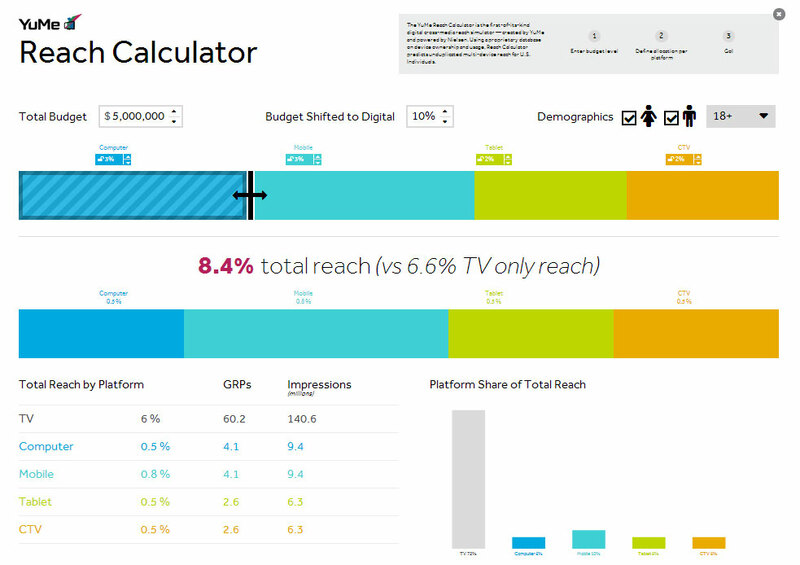 Video advertising solution YuMe recently released a "Reach Calculator" which computes reach (unduplicated) across TV, online, smartphone, tablet, and connected TV, serving as a directional tool for marketers as their develop a strategic plan for multi-screen video. Development of YuMe's Reach Calculator was spurred by the company's research (review a detailed infographic at Webmag.co) into device ownership and how advertisers could more accurately plan reaching their target audience in a multi-screen world. Yume found that the average household has 4.4 devices, that smartphones and tablets are nearly as popular as computers. The video ad network also found that the biggest incremental gain were achieved for marketers when three or more devices were used by the consumer.